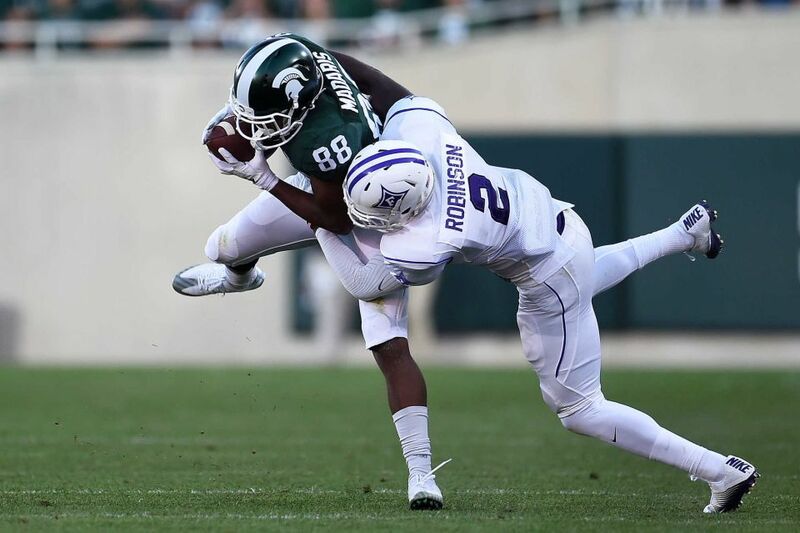 EAST LANSING, MI – Furman held its own against defending Big Ten Champion Michigan State but could not quite come up with enough to pull off the upset. Michigan State came out with how the gamed was expected– a Spartan victory – but the final was just a 28-13 margin in front of 74,516 in Spartan Stadium. Furman trailed 14-0 late into the second quarter but a 20-yard field goal by the Paladins’ Jon Croft Hollingsworth with 19 seconds left in the opening half and another from 23-yard field goal out with 7:34 left in the third quarter brought the Paladins within 14-6. Each of the two field goals, however, had a taste of dissatisfaction. Furman had first-and-goal attempts on each of those drives. Michigan State then started to find some offensive rhythm on its next drive and took a 21-6 lead with 4:26 remaining in the third on a 21-yard touchdown pass from Tyler O’Connor to Josiah Price. Furman responded and finally was able to finish a drive, cutting the Spartan lead 21-13 with 13:37 left in the game on a 6-yard touchdown run by Antonio Wilcox. Furman really seemed in ripe for the upset after linebacker Byron Johnson intercepted MSU’s O’Connorto give the Paladins a first down at the Michigan State 44 with just less than 12 minutes left. But on the first play of Furman’s next drive, quarterback P.J. Blazejowski’s pass was intercepted by Andrew Dowell to give the Spartans the ball back at their 40-yard line. Michigan State (1-0) then put together the game’s deciding drive. MSU went 60 yards in 12 plays and taking a 28-13 lead with 4:55 remaining on a 12-yard touchdown pass from O’Connor to tight end Jamal Lyles. Furman was stopped on downs on its next drive to basically end the game. Freshman Darius Morehead was a highlight for the Paladins after finishing with 83 yards on 20 carries while Blazejowski went 15-for-30 passing for 123 yards for the Paladins (0-1). For Michigan State, O’Connor showed flashes of his abilities, throwing for 190 yards and three touchdowns while completing 13 of 18 passes with an interception. Furman will travel to The Citadel next week, while Michigan State has an off-week before traveling to Notre Dame in two weeks.